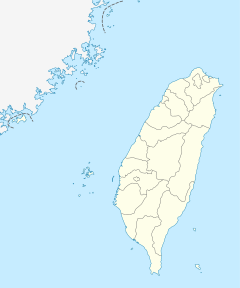 Anding District (Chinese: 安定區; pinyin: Āndìng Qū; Wade–Giles: An1-ting4 Ch'ü1; Pe̍h-ōe-jī: An-tēng khu) is a rural district of about 30,577 residents in Tainan, Taiwan. During the Dutch colonial era the area was known as Bakloan or Baccloan, with a rarer spelling of Baccaluang. The village was one of four main aboriginal villages near the Dutch base of Tayouan, with around 1,500 inhabitants. It was located about 12 kilometres (7.5 mi) northeast of the Dutch base at Fort Zeelandia. Anding district consists of Sulin, Sucuo, Anding, Baoxi, Anjia, Gangwei, Nanan, Guanliao, Zhongrong, Gangkou, Hailiao, Datong, Liujia, Gangnan, Zhongsa and Xinji Borough. ^ Campbell (1903), p. 538. ^ "臺南市政府區公所-安定區". Tainan.gov.tw. Retrieved 2014-05-25. ^ Andrade, Tonio (2005). "Chapter 3: Pax Hollandica". How Taiwan Became Chinese: Dutch, Spanish, and Han Colonization in the Seventeenth Century. Columbia University Press. § 3. ^ "臺南市政府". www.tainan.gov.tw. Retrieved 23 April 2018. ^ Ibp, I. (2016). Taiwan Information Strategy, Internet and E-commerce Development Handbook – Strategic Information, Regulations, Contacts. World Business and Investment Library. International Business Publications, USA. p. 109. ISBN 978-1-5145-2102-1. Retrieved 17 April 2019. ^ "Anding Township". Web1.tainan.gov.tw. 2009-10-26. Archived from the original on 2014-02-21. Retrieved 2014-05-25. Wikimedia Commons has media related to Anding District, Tainan.